BRUSSELS—The European Union says it stands ready to take “appropriate measures” against the Venezuelan regime, with its senior politicians saying they refuse to recognize the legitimacy of President Nicolas Maduro’s government. The statement comes on Maduro’s first day of his second term in office. “The EU will continue closely monitoring developments on the ground and stands ready to react through appropriate measures to decisions and actions that further undermine the democratic institutions and principles, the rule of law and human rights,” the EU foreign policy chief Federica Mogherini said in a statement. Senior EU officials have branded the Venezuela’s general election in May a sham and have called for it to be re-run. The contest saw Maduro return to power with more than two-thirds of the vote, but turnout plummeted to just 26 percent. Venezuela’s regime has already been targeted by sanctions by the EU, the United States, Canada, and a group of Latin American countries amid widespread reports of human rights abuses, targeting of political opponents, and an economic crisis which has left people starving in the streets. In November, European countries unanimously agreed to extend blacklisting measures against Venezuela, which include an embargo on arms and “equipment for internal repression,” for another year. Guy Verhofstadt, the leader of the pan-European liberal group ALDE, said EU leaders should go further and respond to Maduro’s return to power by formally refusing to recognize his government. “The EU should no longer recognize the legality of Nicolas Maduro’s presidency. The ALDE Group and I expect Federica Mogherini to take a very clear stance on behalf of the EU,” he said. However, despite the strong wording of the EU’s statement, it didn’t contain pledges on new sanctions other than that the bloc stands ready to act if the situation deteriorates further. The European Parliament has repeatedly called for EU member states to take a tougher stance on Venezuela. On Jan. 9, European Parliament President Antonio Tajani spoke by phone with Juan Guaidó , who was named the new head of Venezuela’s opposition-controlled National Assembly on Jan. 5, to reassure him of the bloc’s support. The European Commission had already called for the general elections to be rerun after widespread accusations of rigging and an opposition boycott that suppressed turnout. “We have been very clear that the presidential elections were not free nor fair and we regret that in spite of all the calls by the international community, including the EU, no fresh elections in conformity with international standards took place,” European Commission spokeswoman Maja Kocijancic said. 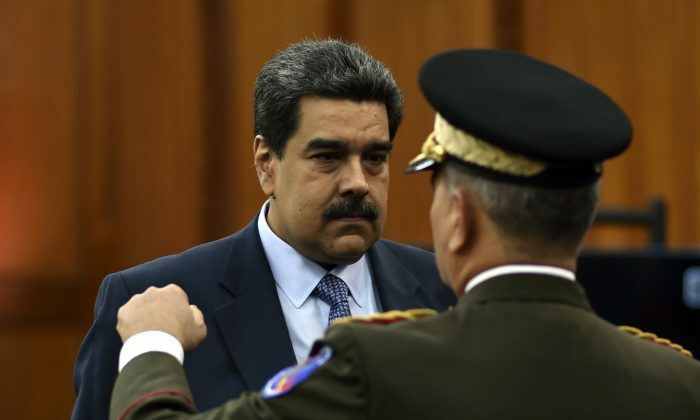 Maduro, who is increasingly isolated both regionally and on the world stage, but still has the support of his country’s military, has dismissed the claims that he has no legitimacy. Thirteen countries from across the Americas have slammed Venezuelan President Nicolas Maduro and introduced new economic and political sanctions in an effort to asphyxiate his regime.